Monburan ('モンブラン', is classified into sweets), is known as Mont Blanc in English, and 蒙布朗蛋糕 (Méng bùlǎng dàngāo) in Chinese. 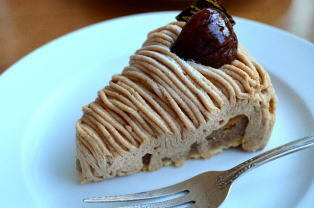 Kuri Keki or Mont Blanc Aux Marrons. Chestnuts, Egg, Wheat Flour, Butter, Granulated Sugar, Whipping Cream and Syrup.